TC18 customer speaker applications are open! This October, Tableau Conference heads to the Big Easy for an action-packed week of all things Tableau. 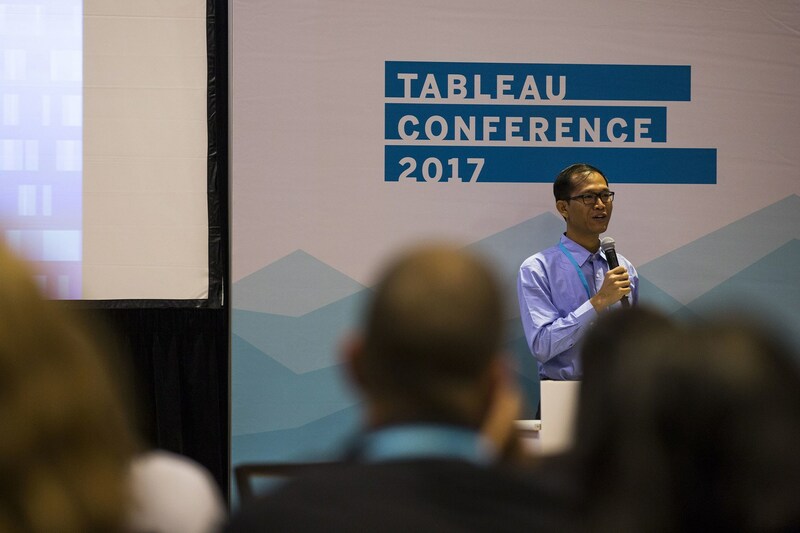 If you’ve dreamed of sharing your Tableau story with thousands of like-minded data enthusiasts, please consider applying to be a customer speaker. Applications to speak at TC18 are open! Customer involvement is a huge part of what makes the Tableau Conference such a special event. Year after year, we hear that customer sessions are the highlight for attendees. Representing a diverse span of industries, use cases, and organizations, we welcome the highest caliber of customer speakers to TC. We hope you’ll apply and join us in New Orleans. Click here to access the application. The deadline for applications is midnight (PT) on Sunday, April 22, 2018.
Who should apply to speak at TC18? Tableau customers with a compelling story to share! Each year, we feature diverse speakers from name brands as well as small-to-medium size businesses, including non-profits, educational institutions, and healthcare organizations. We seek both companies that have enormous Tableau Server deployments and also those using Tableau within a single department or team, inclusive of all industries and functional roles. We're looking for thought-leaders and trailblazers: people who are out on the front lines defining and redefining what's possible with analytics and data visualization. My story is a little offbeat, should I still apply? After the success of mini sessions at TC17, we’re excited to bring them back again. If your Tableau story is non-traditional, a mini session could be a great fit for you! This thirty-minute, lecture-style session on stage in the Expo Hall is an opportunity for you to share with the community what excites you about Tableau and the creative, fun, inspiring impact you’ve made with data. Okay, but as a FTE at my company, I worked with a consultant/partner. Can s/he speak with me? Generally, all speaker applicants must be full-time employees of the company they represent. Your partner/consultant may be present to help with the 15 minutes of Q&A at the end of your session. If you are a partner and would like more information on partnership opportunities, including sponsored speaking sessions, email sponsorship@tableau.com. Consultants and partners: Instead of submitting customer cases as session proposals for the customer track, encourage your customer to submit an application to speak about the joint solution. I spoke at TC17. Can I apply to speak at TC18? It’s very rare that we accept back-to-back customer speakers at this event. Part of what makes TC unique is the brand new content attendees have not seen anywhere else. Unless your proposed session content is significantly different than last year’s, we suggest waiting until next year. You sure can! You can find examples from past Tableau Conferences and our global TC on Tour conferences on our YouTube playlist. What do you look for in successful applications? Be specific in your abstract. Make it clear what you're planning to speak about, what attendees will learn, and why it will be valuable for them. A one-sentence abstract is not what success looks like and neither is a 50-sentence abstract. Show us you know your stuff! There are fields in the application that request background on you and your use case. Don't rush through or ignore these fields. Use them to demonstrate you're someone the TC audience can learn from. Do I get a free pass? Maybe! Tableau offers one full TC18 registration per accepted session. This means if you submit an accepted session with multiple speakers, only one is able to use the complimentary registration. The other speakers will need to buy tickets, although we will provide one discount code for a co-speaker. All customer speakers are also conference VIPs, which means VIP access to events throughout the week and a special speaker party just for you! Tableau does not cover the cost of airfare or hotel for customer speakers. Should I register to attend TC18 if I’m also applying to speak? Yes! We recommend that everyone register early (by April 13) to lock in our early bird pricing, which is discounted by $300, and take advantage of special hotel rates. If you’re one of our accepted speakers, and you’ve purchased a ticket, we will process a full refund once you’ve confirmed your session. When do I learn if I was accepted? We'll notify accepted speakers in late June. If I get accepted, can someone else from my company do the presentation? No. We accept people, not companies, as customer speakers. Please do not expect that someone else from your company can present on your behalf, if you're accepted. Tableau reserves the right to rescind a speaking slot, if the original applicant is no longer available to speak. I have more questions and I'd like to talk to someone live. Feel free to reach out to CustomerSpeakers@tableau.com and one of our fearless Customer Evidence team members will respond asap with more info (and maybe even a few memes).